This third of twelve portraits in 2017, honoring alumni from thirty years of Roth Endowment programs, features noted author Patrick Phillips. You can read about all his publications to date at www.patrickthemighty.com! Patrick won a Project Support Award to Denmark in 2014 to help him undertake research for his next book project. He teaches creative writing, literature and literary translation at Drew University, where he also directs the Creative Writing Program. The winner of many fellowships and honors, Patrick has published three volumes of his own poetry—the most recent of which, Elegy for a Broken Machine, was a finalist for the National Book Award—and translated a volume of poetry—When We Leave Each Other: Selected Poems of Henrik Nordbrandt—from the Danish. 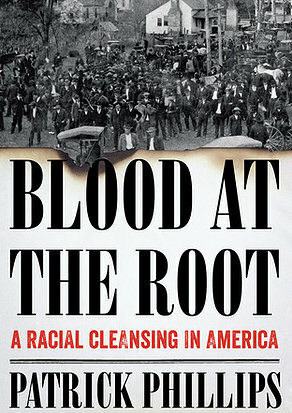 If Patrick’s name seems familiar to you, however, it may be for his first book of nonfiction, Blood at the Root: A Racial Cleansing in America, which has been garnering a great deal of attention, including in a PBS Newshour piece that aired on Martin Luther King Jr. Day. In gripping prose, the volume chronicles the tragic history of Forsyth County, Georgia, where Patrick grew up. While lynching was not uncommon in Georgia in the early 20th century, the 1912 murder of a white girl in Forsyth led to a coordinated campaign of arson and terror that drove all 1098 black citizens from the county. In the wake of the expulsions, whites harvested the crops and took over the livestock of their former neighbors, quietly laying claim to “abandoned” land. Building on his own childhood experience, Patrick documents the violent means by which locals kept Forsyth “all white” well into the 1990s. “I think my two prose projects are deeply related, in that they both grew out of my fascination with hidden history: shocking, monumental, and once widely-known events that over the course of time have been erased. Both books are accounts of atrocities: Blood at the Root tells of the expulsion of the entire African American community of Forsyth County, Georgia, where I was raised, and The Burning Desert documents the attempted genocide of Bedouin people by the colonial Italian army. “As far as chronology, I have been thinking about the story of Forsyth County’s black community since I was seven years old. I started actively researching the book about a decade ago. During this same period I learned about The Burning Desert from a writer and translator named Andre Naffis-Sahely, who knew many Moroccans who revere Holmboe for telling the world about the genocide in North Africa—a bravery that cost Holmboe his life. Andre reached out to me in hopes that a new translation could bring fresh attention to the book and to that history. “What links the two projects, beyond the appalling crimes committed against vulnerable people, is that both events have been almost totally erased from our consciousness. So a common goal of both Blood at the Root and my translation of Holmboe was to bring a buried history back to the surface. History is written by the victors, as they say, and so I wanted both books to counter that, by telling the story of the victims, and reversing that process of erasure and historical amnesia. “I should also add that these connections are something I see only in hindsight! At the time, I was simply following my curiosity and trying to make myself useful. But clearly one project was influencing the other, and I have no doubt that I was deeply influenced by Holmboe’s drive to expose an atrocity—and to honor the dead by telling their stories. “The support of the Roth Endowment was absolutely essential to my work on Holmboe, particularly because it came during the very early stages of the project. The grant I received from the Endowment helped support a month I spent in Copenhagen, where I got my conversational Danish back up to speed; spent time in the Kongelige Bibliotek reading Holmboe’s work as a journalist; and devoted long days to translating the text of The Burning Desert. “Translation is always a labor of love, and that means the translator can often feel very lonely: like the only person in the world who cares about a given author or text, and like someone laboring for very little reward and attention. But receiving a grant meant that for the first time I could take my own interest in Holmboe seriously. Someone else had given that work a vote of confidence and a push forward, which meant the world to me. So everyone at the Roth Endowment has my deepest gratitude! This alumni portrait was drafted by Roth Endowment chair, Skyler J. Arndt-Briggs, based on a short interview with Patrick Phillips. Thanks to Drew Barnhart, our Media and Outreach Manager, for producing this third 2017 alumni portrait!